“Green way before it became the new black,” author, hospice nurse, and mother Kenna Lee always felt she was one step ahead of recycling, reducing, and reusing until the birth of her third child. Suddenly plagued with guilt for overpopulation, overconsumption, and overheating the earth, especially when forced to give up her “veggie oil conversion” car for a minivan to fit all the car seats, Lee begins to question all the choices she makes in the name of saving the planet and making the world a nurturing place for her children. The result is a series of entertaining, episodic essays that span the first three years of child number three. With self-deprecating humor, Lee acknowledges the ridiculousness of driving her fossil-fuel guzzling car to the organic grocery store or blending strawberries instead of red dye into her daughter’s requested pink birthday cake. She also recognizes her obsessive, maternal eco-anxiety over such choices as light bulbs (do more efficient compact fluorescents actually create “electrical pollution?”), cookies with artificial margarine instead of butter (should a family-friendly establishment be avoided because of a little hydrogenated fat? ), and plastic-free gifts for her children (would a letter to close friends and family be tacky?). As Lee tries to reconcile her idealistic need for global change with realistic time constraints, creature comforts, and affordability, she realizes that her situation is “not black and white, that we can preserve even as we destroy, and that maybe as the generations pass, the balance between these things can be shifted.” Learning to focus on hope rather than the daunting task of saving the earth single-handedly, she adopts a mantra of a million tiny things. By concentrating on the small changes that individuals can make, and having faith that others are making these same small changes, Lee believes that the world can become a better and sustainable place to live. An online contributor to literarymama.com, witnessthewaywelive.com, mamazine.com, and other ecological and literary zines, Lee has also published personal essays in Brain, Child magazine, The American Journal of Nursing, and Northern California Bohemian. In tune with her mantra, a portion of her author proceeds will be donated to environmental causes. 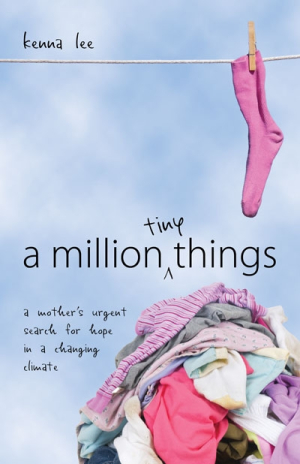 An accompanying website, milliontinythings.com, offers related environmental reading suggestions and ways to become more active in environmental change. Both insightful and inspirational, this collection will motivate readers to look for their own million tiny ways to make a positive difference.